Macaroons are small, circular cakes made by folding whipped egg whites into a dough made from ground almonds and sugar. Flavourings such as vanilla and citrus zest are often added, while coatings applied by rolling the dough in crushed nuts such as flaked almonds or pistachios, or drizzling with chocolate after baking, are also common. In France I have come across almond macaroons where a cherry has been placed in the centre of the dough, which has then been rolled into a spherical ball (like in my Cherry Almond Macaroon recipe). 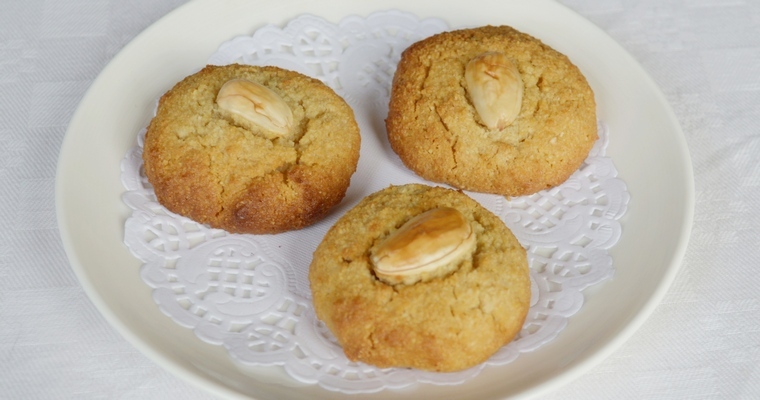 However, it is more common to see almond macaroons flattened into a disc shape, as this allows the centre to cook through (although the general idea is to maintain a slightly gooey centre beneath a chewy outer crust). When using honey it’s good to include a strong flavouring such as the orange zest or vanilla extract, as the taste of honey can otherwise dominate. Preheat the oven to 160°C/320°F. Line a baking tray with baking paper. Combine the ground almonds, honey, orange zest and salt in a mixing bowl. Mix to form a crumbly dough – if you are using set honey, or finding it difficult to incorporate the honey, then lightly rub it between your fingertips until the mixture resembles breadcrumbs. Lighten the almond mixture by stirring in half of the whisked egg whites. Tip in the rest of the egg whites and gently fold in using a spatula: cut down the centre with the side edge of the spatula; scrape across the bottom of the bowl and up the side, scooping up the mixture as you go so that it is turned over and under; rotate the bowl 90° and repeat until fully blended. Be careful not to overwork the mixture and knock out the air, but make sure the bitter egg white is fully blended. You should have a thick dough. Wet your hands, then divide into 10 balls by loosely rolling between the palms of your hand. Flatten into discs and tidy up the sides. Arrange on the lined baking tray. Leave some space between each macaroon, as they will spread slightly during baking. Use a pastry brush to lightly brush the surface of each macaroon with water. Top each cake by pressing a whole almond into the centre. Transfer to the preheated oven and bake for 20-25 minutes, until lightly brown. Turn the tray halfway through for even colouring. Transfer onto a wire cooling rack using a palette knife or fish slice. Once cooled, transfer to an airtight container and store at room temperature, where they will keep for 1 week. If you prefer a chewier texture, leave on the cooling rack overnight before transferring to a container.